When Karen asked me if I fancied signing up for this race last year, I automatically assumed she meant the half marathon. 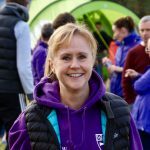 After all, we were already booked to do the Paris Marathon in April…When she told me she’d entered the marathon, I was a bit apprehensive, but having checked with Kate Macpherson (who wrote my last marathon plan) that it wasn’t a completely mad idea, I signed up. 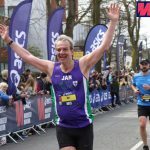 Training began in November, I dug out the training plan we had used for the Liverpool marathon last year, (the one I didn’t get to run as I fell and broke my wrist a few weeks before the race). Karen and I decided to run the long runs easy, as neither of us had done an off-road marathon before, and certainly weren’t going for a time. Many of our long runs were done in some awful weather conditions – snow, ice, wind, rain. We kept telling ourselves this would stand us in good stead for the race itself, which it did! Luckily the weather on the day of the race was really kind to us. When my alarm went off at 05.10 on the morning of the race, I did wonder what on earth I was doing! I crept out of the house to get picked up by Karen’s husband who was driving us to Kate’s house. Kate had very kindly offered to drive us up to the start at Bamburgh, for which we were really grateful! It was a freezing cold morning, but the heated seats in Kate’s new car warmed me up nicely! When we arrived in Bamburgh it was the most beautiful morning, the sun was just coming up and it looked like it was going to be a lovely day. It was still windy and freezing cold, but we’d soon warm up once we started running. We headed to registration, and as we’d arrived in good time there was no queue, so we picked up our numbers and timing chips (which we had to wear on our wrists) and could get ourselves ready without any stress. There was even no queue for the (proper) toilets – bliss! It was lovely to meet up with some other runners from Durham, and at 08.30 we were told to gather in the courtyard for the briefing. This was really informative and light-hearted, we were told which signs to look out for so we didn’t get lost, what to do with our timing chips at the checkpoints, and what to do in case of an emergency. We then boarded the coaches which took us to the start at Alnwick Castle. We climbed over a fence, headed for the flags, luckily didn’t need the toilet again as there were none, and at 09.30 we were off! We ran along by the river Aln, a bit claggy in places, but nothing too bad. 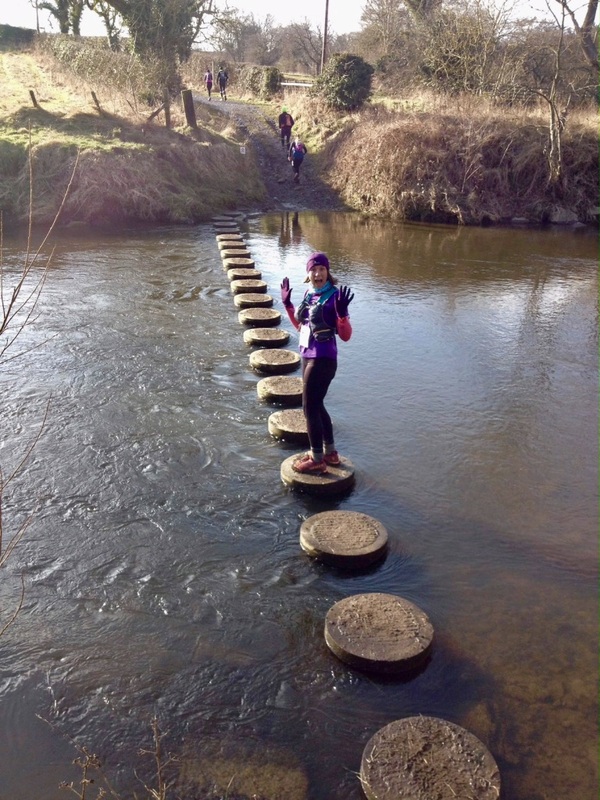 Crossing the river on the stepping-stones was a bit nerve-wracking, but luckily I didn’t fall in! 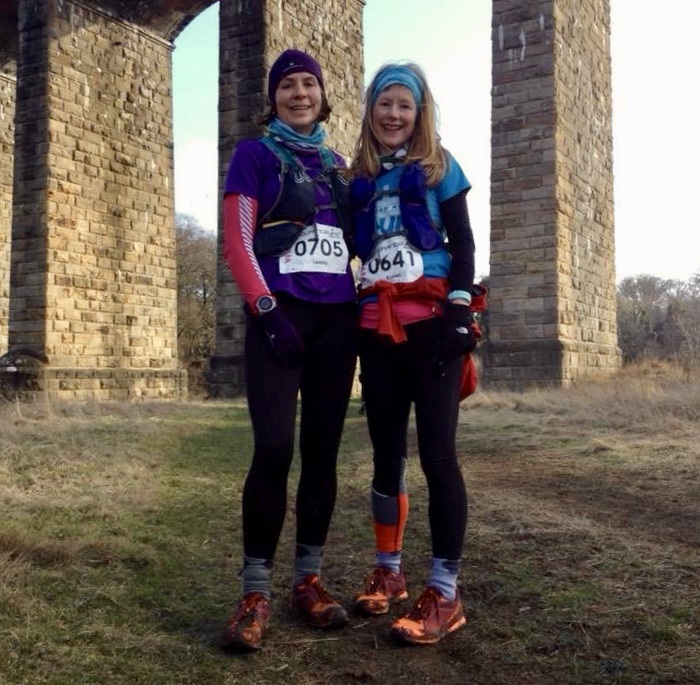 We then ran under the Alnmouth viaduct, where a nice runner from Finland offered to take our photo. We were on the roads after this and headed for Alnmouth harbour where the first checkpoint was. It was nice to be able to stop at the checkpoints, put our timing chips into the machine, fill up water bottles and grab a bite to eat. We were off again, following the extremely well-marked course, and onto our first beach of the day at Almouth. Just wow, so beautiful! I felt really lucky to be running on such a beautiful day in such a stunning setting. We ran through Boulmer, found a toilet (phew!) and off we went again to Longhoughton and then lovely Craster. 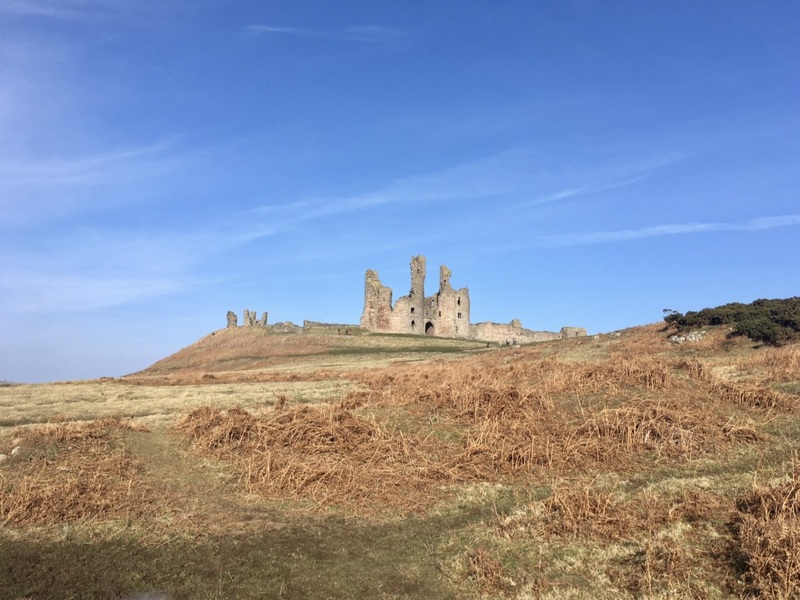 Soon we could see Dunstanburgh Castle in the distance – yay! Another stop for some photos (it would have been rude not to!) There were quite a few people out on the paths here, so we slowed down a bit, it was also quite challenging terrain so we were happy to take it easy! 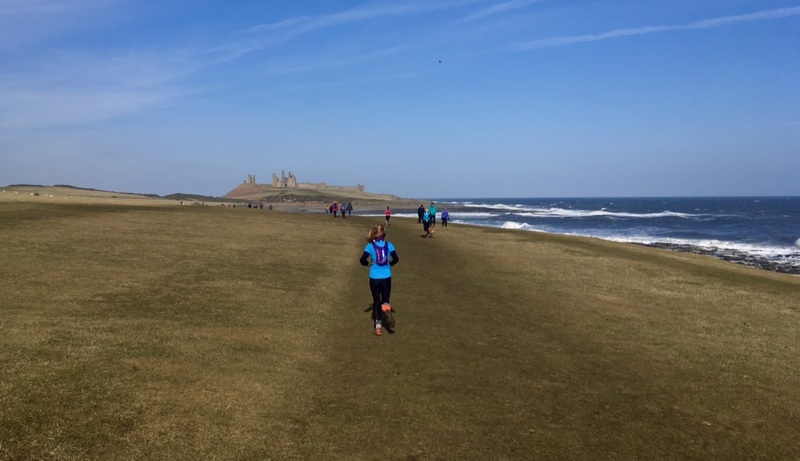 We ran through Low Newton and on to Checkpoint 3. This was the key checkpoint as you had to make it here before 2.20 – luckily, we were much earlier than this. Another stop to chat to the very friendly marshals, fill up bottles again and grab some more food. I had brought loads with me. Normally I would use gels for fuel, but chose a Clif bar and shot bloks for this race, which worked really well. 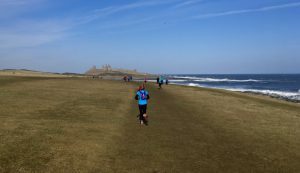 We ran on to Beadnell beach – this was a particularly stunning part of the course as there were quite a few kite-surfers in the sea, which was an amazing sight! Cue another photo stop – why not! I felt like I was on familiar territory now as my parents have a caravan in Seahouses and it was lovely to run on the beach and through the town. Fortunately, we didn’t have to run past the fish and chip shops! Back on to the beach now and the final stretch towards Bamburgh castle. The marshals at the final checkpoint confirmed it was only 2 miles to the finish – brilliant! I picked up a bit of speed on the beach, the wind was behind us and the tide was out (thankfully!). 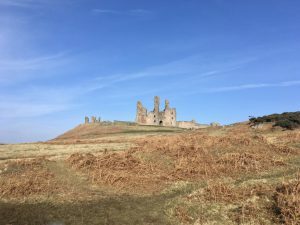 I hit 27 miles, but no sign of the castle? Had someone moved it? Had I missed a sign somewhere and gone the wrong way? 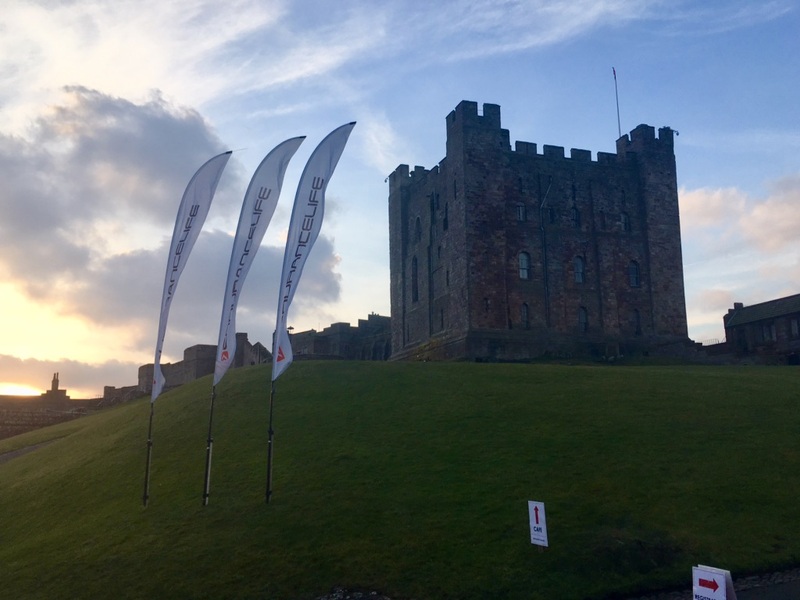 Luckily, I passed a few other runners, some doing the Ultra (who had to get to the Castle then do an additional 8 miles on the roads to make up to 35 miles). A man who was supporting his brother on the Ultra told me to aim for the white flags, which finally I reached, phew. But the castle is at the top of a hill of course, which meant climbing up the dunes to get there, aaaaaargh. 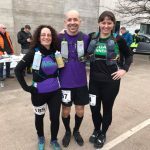 After 27 miles, my legs were not up for an uphill sprint finish, so I power walked up, cheered on by Jacquie Robson and lots of supporters at the top. Round the corner and there was the finish – at last!! Gave in my timing chip and got a printout with my time on straight away, very efficient! Medal, t-shirt (nice colour blue!) and cheered Karen in. Quick change (well as quickly as our aching bodies would allow), on with lots of layers and into the café to refuel – lovely! No post-race medal photo as we were too cold! All in all, I would recommend this race to anyone. There is a 10K, half marathon and ultra (all on the same day). 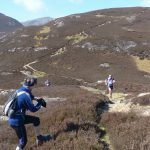 The race organisation is superb, the course is extremely well marked so no chance of getting lost, and the whole route is absolutely stunning.